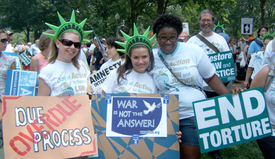 WASHINGTON — One week before our nation’s July 4 celebration, thousands of protesters wearing Statue of Liberty crowns and holding signs reading “Torture is wrong” rallied on Capitol Hill to demand that Congress restore constitutional freedoms shredded by the Bush administration. The June 26 rally was the centerpiece in a series of actions across the U.S. calling for restoration of fundamental freedoms. Anthony Romero, executive director of the American Civil Liberties Union, welcomed the crowd to Upper Senate Park, hailing them as “true heroes” for traveling overnight by bus to spend a sweltering day lobbying the House and Senate. Romero urged lawmakers to repeal the Military Commissions Act, which was passed in the waning days of the Republican-dominated Congress last year. It eliminated the basic civil protection of habeas corpus — literally meaning “show me the body,” this is the long-standing right of anyone detained to be told why he or she is being held. Romero recalled the “dark days” following Sept. 11, 2001, charging that the tragedy “was used by the Bush administration to advance a highly ideological agenda and seize greater powers.” In the wake of Sept. 11, Congress passed the Patriot Act, which opened the door to the administration’s warrantless spying, detentions without criminal charges or the right of legal representation, secret prisons and torture. He compared suspending habeas corpus to the mass internment of Japanese Americans during World War II. “That didn’t make America safer. It put a stain on America,” he said. When Leahy mentioned Attorney General Alberto Gonzales, author of a memo for President Bush justifying torture and mass detention, a chorus of boos drowned out his words. “I yearn for the day when we have an administration in the White House that upholds the Constitution and follows the rule of law,” Leahy said. Rep. Jerrold Nadler (D-N.Y.) told reporters that legislation to restore habeas corpus will be acted on by several House committees within the next few weeks. The ACLU partnered with Amnesty International, the Leadership Conference on Civil Rights, the National Religious Campaign Against Torture and more than 50 other organizations, representing more than 4 million Americans, for the campaign to restore rights. The rally came as the media reported new releases of declassified intelligence files that underscored for many the urgency of protecting civil liberties. The files, dating back decades, show, among other things, widespread government spying on peace groups and secret plans to assassinate foreign leaders.